In this video Christopher Marki explains the principles of modern mixer design at the Silicon Valley IEEE MTT chapter meeting on January 22, 2015. Unlike the “square-law mixing” description commonly given in textbooks, commercial mixer designers use “commutating mixer” theory. In this video Christopher Marki explains the technology behind the ridiculous dynamic range of the T3 mixer at the Silicon Valley IEEE MTT chapter meeting on January 22, 2015. Ultra-broadband baluns, fast rise time LO generation, and feedback linearization circuitry are the heart of the technology. In this video Christopher Marki explains the similarities and differences in MMIC and Microlithic mixer technology at the Silicon Valley IEEE MTT chapter meeting on January 22, 2015. Both technologies use a similar multilayer stackup, but significant differences influence the choice of mixer for high performance applications. 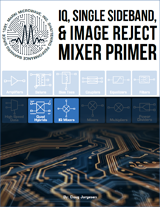 In this video Doug Jorgesen explains the motivations, basic operations, and some applications of IQ, image reject, and single sideband mixers. by Doug Jorgesen, Ph.D and Christopher Marki, Ph.D. of Marki.